I have amended the forum rules to disallow posting of any classified ads whether they are for live birds, cages, or supplies. This is to protect the buyer, seller, and birds involved. The forum has no safeguards for online commerce and there is no way of guaranteeing that transactions are legitimate. 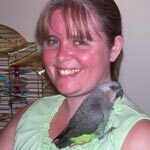 The Parrot Forum is a place for discussion of parrots and not exchange. Discussion of unrelated classifieds (by linking, not reposting) is still permitted in casual discussion. For instance if someone saw a funny or ridiculous ad and wanted to discuss the contents, that is allowed but only as long as there is no personal interest in promoting that sale. Feel free to respond with links to good sites that people can use for posting their ads instead of on the forum. I know Kijiji is a pretty popular one and they work hard to prevent scammers.